When deciding what model weather station to buy, there are a number of factors that must be considered. The most important of these are considered below. Cost is easily one of the most important factors as the budget you as the buyer are working with is directly related to the quality of the weather station you will be able to buy. While there are many other important things to consider, it stands to reason that those willing to spend more will get more out of their product. The weather variables themselves are also very important. The kinds of information you are trying to collect will play a great part in determining what type of weather station you will want to purchase. If you are looking to collect basic data like temperature, humidity, and air pressure, the Vantage Vue personal weather station will probably be best for you. If you are interested in observing more advanced weather conditions like rainfall, wind speed, and ultraviolet radiation, a Vantage Pro2 weather station will suit you better. Before you buy a weather station, you have to put a great deal of thought into where you will put it, its site of installation. If you plan to buy a cabled station, consider the distance the indoor display console will be from the weather sensors. If the station you have your eye on does not have a cable long enough for your preferred installation site, an extension cord may be available for purchase. The sensors of the Vantage Pro2 wireless weather stations are able to be placed farther from the display console, but the range is not infinite. There is a maximum unobstructed range of 300 meters, with the actual effective range being about a half to two thirds of that, based on the number and type of building materials obstructing the signal. Radio interference will decrease the effective range as well. 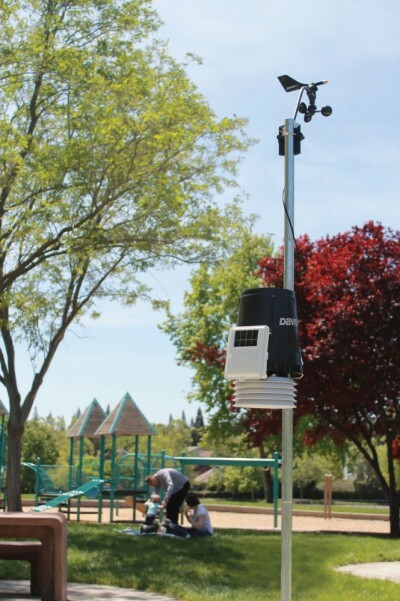 The Davis weather stations have the option of connecting to your computer, which is very useful. With it, you will be able to use your computer as if it were your console, and you can do a number of things a standard display console cannot, including forecasting, graphing trends, posting data online, and sending email alerts. A data logger is available, which will allow your console to store data for later retrieval. How easy is it to set up the station? With many competing stations, you need to install each sensor separately. Our Vantage Pro2TM professional weather stations are designed to make setup as easy as possible. The Integrated Sensor Suite is factory-assembled. Just complete a few minor assembly steps, insert the battery, and you're ready to mount the sensors. Mount them all together using our optional tripod, or detach the anemometer to mount it separately. Flexible mounting options make it easy, either way. What is the maximum transmission distance? Although transmission range is highly variable (depending not only on the surrounding physical features of the land and structures but also on the RF interference in the area), our Vantage Pro2 weather stations will almost always out-perform the competition, transmitting up to 1000 feet (304.8 meters) line of sight. We also offer wireless repeaters should you wish to extend the range even further. What weather variables are measured and recorded? •	Additional Rainfall: 15-minute rainfall, hourly and monthly rainfall, and rainfall amounts for each of the last 24 storms. •	Additional Wind Speed: 10-minute average wind speed, direction of high speed, and 10-minute dominant wind direction. •	Apparent Temperature: Heat index (the combined effects of temperature and humidity) and, with the addition of a solar radiation sensor, temperature-humidity-sun-wind index. •	Optional Sensors for Solar and UV Radiation, something that's becoming more important as we become increasingly aware of the dangers to health caused by excessive exposure to the sun. •	Additional Information (with optional sensors) for agricultural users: Evapotranspiration, leaf wetness, soil moisture, and soil temperature. How many highs and lows are measured and recorded? Most other stations simply give you the current readings. If highs and lows are available at all, they are usually limited. Vantage Pro2 gives you the highs and lows (and/or totals or average readings) for just about all available weather conditions for the last 24 days (with time of day), months (with date), or years. And not only can you view the data numerically, you'll also see it on Vantage Pro's on-screen graphs, giving you instantaneous visual representations of long-term trends. The Vantage Pro2 transmitter sends a data packet to the console every 2½ seconds. The weather conditions that are the most variable (such as wind speed and direction) are updated with each packet, while most other conditions are updated every 10 seconds. With the competition's stations, the update interval is much longer: 30 seconds, or even 3 minutes or longer. This may not seem like an important distinction. But try watching the wind gust, or the rain suddenly come pouring down. It's very disconcerting to be looking out the window, seeing something happening weather-wise, and not see it reflected on the console for what seems to be an eternity. Can you use the station at higher elevations? Our stations can be used up to 12,000 feet (3.66 kilometers) in elevation. If you're lucky enough to live and work or perhaps enjoy a vacation home in the mountains, you'll find that our Vantage Pro2 weather stations work just fine, no matter what elevation you're at. How is the forecast generated? The competition generally bases their forecasts strictly on whether barometric pressure is rising or falling. This results in predictions that are not very accurate. Vantage Pro2 uses a sophisticated forecasting algorithm which takes into account not only barometric pressure, but also wind, rainfall, temperature, humidity, and longitude and latitude. The result? A much more accurate forecast. Not perfect, but even the guys with the satellite pictures don't always get it right! How is the forecast displayed? The competition gives their forecast by means of an icon. We have similar icons, plus over 100 different forecast messages that scroll across the bottom of the display when you press the FORECAST key on a Vantage Pro2. None of the other stations have this scrolling message--it is unique to Vantage Pro2. The ticker tape also gives additional information, depending on which key you press. For example, press the WIND key to display wind speed, and you'll see a message showing you the 10-minute average wind speed. If it's raining, you can press the RAIN YR key to see the last 15 minutes of rain, or RAIN DAY to see the last 24 hours of rain. And these are just a few examples! How much data can you graph on the screen? With Vantage Pro2, you can graph just about every weather variable, with averages and highs and lows for most, and go back in time for minutes, days, months, and years. The competition typically graphs only barometric pressure and typically just for the last 24 hours. With all the graphs on Vantage Pro2, you can do tons of analysis, even without purchasing an additional software package (although we offer one of those, too). And you'll find that the more dramatic the weather is, the more fun it is to look at the graphs. Just how windy is it, and how does it compare to the last windstorm? And how much rain did we get this month, as compared to last month? What is the computer interface like? If you'd like more analysis and historic record-keeping, you can add our WeatherLink data logger and software package. The data logger stores data at the interval you choose (from one minute to two hours) for up to six months. You can transfer the data whenever you like, or leave your computer on to have it automatically transfer every day. The data logger uses non-volatile memory, so you won't lose the data even if you lose power. You can also use our WeatherLinkIP to upload to the internet with no web experience required, only a few minutes to set up. How many alarms are there? On Vantage Pro2, alarms can be set for just about every weather variable, for just about any reason imaginable. There are up to 65 alarms, in all. Like the graphs, the alarms found on the competition's stations are generally quite limited. What is the accuracy, resolution, and range? Our Vantage Pro2 weather stations generally beat the competition in accuracy, resolution, and range. It can be difficult to find the specs for competing stations. We are very proud of our specs, stand behind them 100%, and are proud to publish them.